Since the debut of former North Carolina A&T running back and current Chicago Bears standout Tarik Cohen, interest in historically black college prospects is on the rise. With that kind of interest it might not be long until we see another golden age of HBCU NFL talent. In this year’s NFL draft, former South Carolina State linebacker Darius Leonard was selected in the second round by the Indianapolis Colts with the No. 36th pick overall. That makes the two-time Mid-Eastern Athletic Conference (MEAC) defensive player of the year and the Bulldogs’ all-time leader in tackles, one of the highest HBCU prospects taken in recent history. Leonard believes his speed, athleticism and intelligence about the game can help get him on the field in Indianapolis early. However, it’s his work ethic and ubiquitous “chip on his shoulder” that could turn Leonard into a standout performer for the Colts. Brandon Parker in the locker room at the Joseph And Kathleen Bryan Fitness And Wellness Center at North Carolina A&T in Greensboro, North Carolina, Aug. 24, 2017. 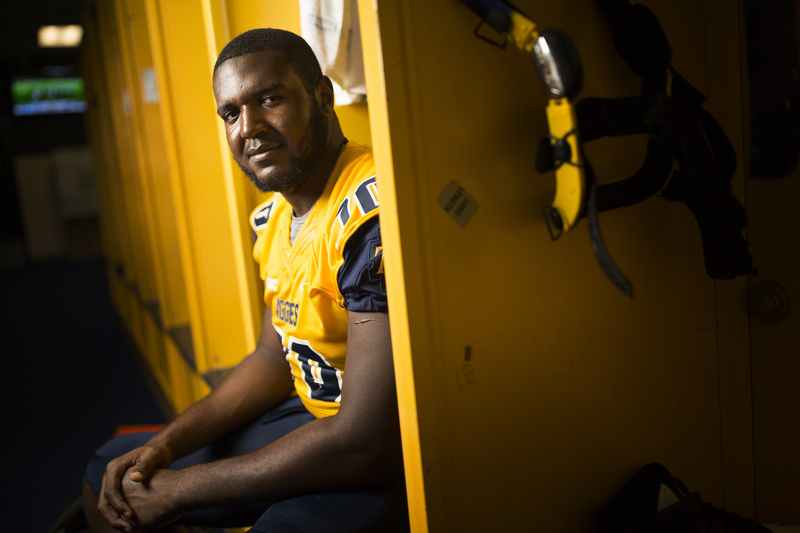 One of his HBCU colleagues, N.C. A&T offensive lineman Brandon Parker, a two-time MEAC Offensive Lineman of the Year award winner and a first-team All-American at N.C. A&T, was selected by the Oakland Raiders in the third round with the 65th pick overall and has a chip of his own. Parker is confident he can bring a toughness and a will to work that can help benefit his new team. Whether it was Leonard being inspired by his brother, former NFL player and Clemson Tigers standout Anthony Waters, to become the best player he could possibly be, or Parker, who was inspired by his father to never be discouraged and trust God’s plan, it seems evident that NFL teams are paying attention to HBCU talent. Others HBCU players who weren’t selected but signed free-agent contracts include three Grambling players: Martez Carter agreed to a free-agent deal with the Washington Redskins, Montrel Meander signed with the Cleveland Browns and Trent Scott with the Los Angeles Chargers.